How nice to sit by the fireplace! Feel the warmth of the fire and enjoy the special atmosphere of comfort and tranquility. However, to make a real wood-burning fireplace only happen in a private home. How to be residents of high-rise buildings? If you strongly want to be in the house this area, you should pay attention to decorative fireplaces that combine aesthetics with safety. Decorative fireplaces cleverly mimic the real thing. The design of the lamp housing is installed, which creates the effect of a burning flame in the hearth. Scarlet light illuminates the elegant plastic woodpile. 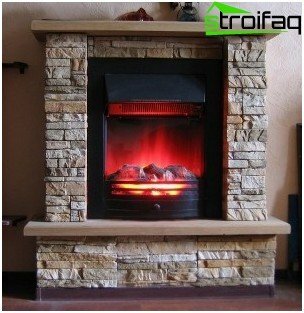 Fireplace portal is performed mostly of MDF finished wood veneer (oak, beech, mahogany) or of the stone (granite or marble). In addition to these options available and less expensive decoration - chipboard. Decorative fireplaces are divided into interior -those that have a solely aesthetic function, and heating - equipped with electric heaters, which provide heat. 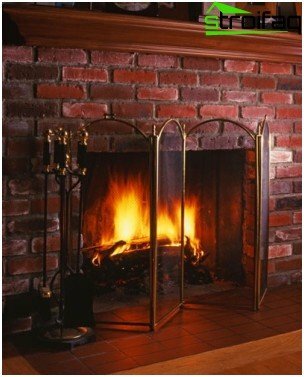 In heating fireplaces use plastic items are not worth it, because they tend to be deformed when heated. It is recommended to use materials that are resistant to heat - for example, a brick. 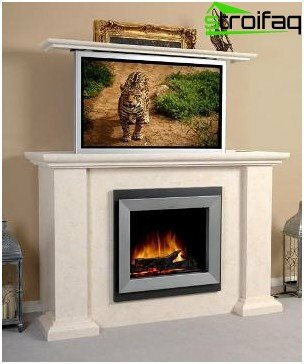 If you want to know what else there are fireplaces,type in a search engine "decorative fireplaces Picture" and then view images! 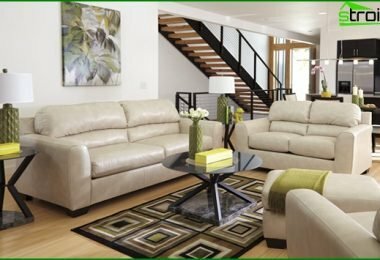 Depending on the design of several types of fireplaces. Indoor plants do not take up much space, but to build them only during the construction of the house. Semi fireplaces can be attached to a wall or positioned inside the wall. Open fireplaces occupy a central place in the room and are a highlight of the interior. 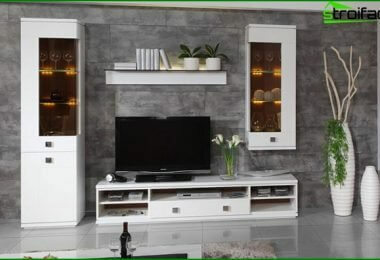 The decorative fireplace can stand against a wall or in a corner. The most viable option for the interior of an apartment building is considered fireplace made of plasterboard. So if you're staying on this decision, it is necessary to consider in more detail how to make a decorative fireplace yourself. 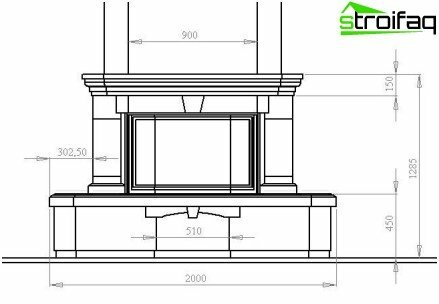 The first thing to do is - to create an edgethe rigidity of the decorative fireplace using UD profile type guide. Profile is anchored to the floor and wall with dowels. Then you need to insert the CD profile in the guide profile and connect them with screws metal. After the frame construction should starttrim it with sheets of drywall. The material is cut a special cutter and attached with screws to the profiles. Then, the procedure to be caulking. Putty necessary seams between the sheets, the ends of the fireplace and place fastening screws. During the putty is to lay perforated angle to the fireplace in the house edges are perfectly smooth. For the heating fireplace is necessary to choose the material firmly resists heat. An excellent option is brick. For such an arrangement Fireplace bricks need, Mortar, grate, steel sheet, the level and plumb, wooden slats, nails and a hammer. 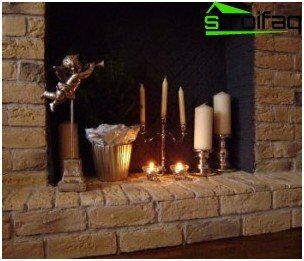 Decorative fireplace in the apartment of brick makingIt is not difficult! First is to nail the steel sheet to the floor and lay out of the raw material base and side walls. This is followed by fixed side rails on the top of the structure. And you can start vaulted ceilings laid out. Lath the product must be removed after fulldrying of the solution. Topped with a fireplace can be a wide shelf, which is made of foamed concrete or wood. Then, in the hearth of the fireplace is installed grate made of steel rods. And you only put a few logs - plastic artificial or natural, as well as to mount a light bulb. After the construction of the fireplace can begin todecorating. 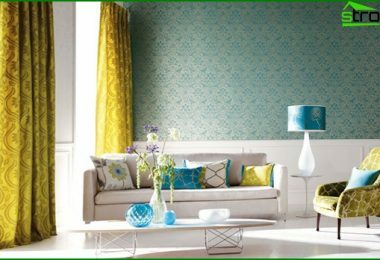 The cheapest option - to paint or paste over a colored decorative film. For this is proshpaklevat carefully sanded and the surface of the fireplace. You can decorate the design of fragments of porcelain and colored glass. Decorative fireplace in the interior will create a feeling of cozy home "nest"
Not a bad solution - facing ceramictiles. 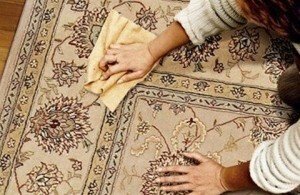 Furnish to start from the bottom row, tiles fixed with a heat-resistant putty, and setting occurs through the day. You can finish tiles. Due to the color blue decorative fireplace with his hands It looks great! To fire looked really impressive, inits decoration use an artificial stone. 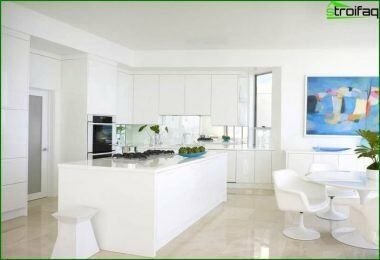 Often practice elements and stucco moldings of polyurethane, which can be left white or painted in any color. But the most expensive decoration is done in English style. To do this, the front and side wall trim plates stone - onyx and jasper. To create a fire effect is accepted to dohighlighting the portal. It is also possible to place lighted candles, and to visually increase the number of candles can oblitsevat mirrors rear wall niche. Then decorate the shelf chimney is different figurines, clocks, and family photos. Now you understand that a decorative fireplace in the house under the power to make everyone. It does not require special skills and significant financial investments.